Dining in Atlanta has long been a personal passion and the city's restaurants consistently tempt and often please the palette. ONE midtown kitchen was a favorite of mine when I visited Atlanta several years ago and I hoped I'd not over romanticize previous dining experiences there, especially living here again and being on the hunt for a new short list of favorite restaurants. The reputation it earned then remains intact—superior service, delicious food and a New York City look-and-feel atmosphere. The restaurant's selections change daily, which puts forth a challenge: How does one select only a few courses from a continually well-rounded, delicious-sounding menu? This particular dining excursion started with vino, of course. At the recommendation of our server, Candice, I had the John Anthony Sauvignon Blanc and my dining companion, whose birthday we were celebrating (it was the day before), had a pinot noir. Both were generous pours, balanced in aroma and flavor, and were well-suited for the meals we were about to enjoy. The first course was a plentiful cheese board—their "Artisan Cheese." I could have made a meal out of this dish—a selection of five cheeses (goat, sheep and cow's milk) from the U.S. East and West Coast and Italy—paired with a passion fruit mostarda (a gelatin/jelly consistency accompaniment) and a compressed carrot cake. Pleasing my always cheese-curious ready-do-dine nature, my favorite combination was the New Hampshire Farmstead Cheese and the compressed cake. The contrast of the sharp and sweet flavors targeted just the right nodes on my tongue. The Carnaroli Risotto, my entrée, was infused with white truffle, ricotta and warm tiny tomatoes that burst in my mouth when I bit down on them. A side of asparagus drizzled with a mustard vinaigrette rounded out the pre-dessert portion of the meal, which I was enthusiastically looking forward to. Dessert, which I sometimes forego to save a few calories, was mind-bending phenomenal. A cylindrical lemon curd and a scoop of raspberry sorbet, sprinkled with candied ginger and chocolate crumbles, were accompanied with a perfectly swirled dollop of crème fraiche. This union of flavors would satisfy any dessert connoisseur. The best part…the portion was such that it was satisfying without being guilt-inducing. During the course of our meal, the restaurant manager visited our table to inquire if we were pleased with our meals. A resounding positive affirmation flew from our lips, but what made that tiny experience remarkable was that the manager wasn't traveling in an obligatory manner from table to table, he had visited only our table and then returned to his duties in the kitchen or office, I wasn't sure, but I was impressed. After dinner, I asked Candice what is her favorite dish on the menu. She very confidently replied, "the Crispy Flounder." She noted the silver queen corn as the determinant for her choice and pointed out that other dishes also contained this ingredient. One midtown kitchen has made a public commitment to using sustainable, local products—a popular and respectable choice in today's restaurant world. In the realm of atmosphere, ONE midtown kitchen is, from my observation and experience, a combination of a wine bistro (the bar) and a fine dining experience (the dining room), sharing the same open space. 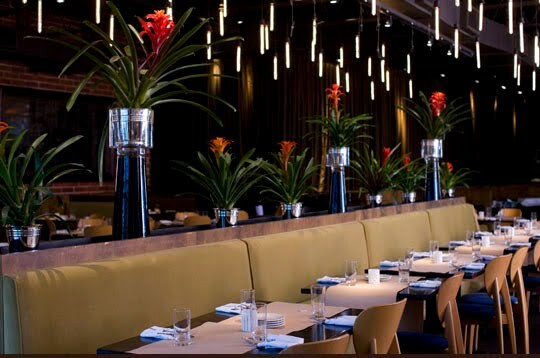 My favorite design feature, by far, are the wide-spread, but ample collection of test tube shaped light pendants hanging in the dining room…those and the overall ambiance are what gave me the feeling of dining in a New York City restaurant on my very first visit to ONE. The wine selection is ample, but not obnoxious, and the wine menu is organized in a way that makes it a breeze to choose a varietal, whether a novice wine drinker or an experienced sommelier. The restaurant offers wine by the bottle, glass, ½ glass and they have a bottomless option. The restaurant has a nondescript exterior and is located on a quiet street in Midtown—Dutch Valley Road. You indeed do have to know where you're going. It's not one of those places you just happen upon. Once you find it, you'll recall exactly where it is because it's absolutely worth remembering. Making reservations couldn't be easier. I made mine through Open Table, a free online reservations website, accessible from the restaurant's website or directly from the Open Table website. You can also call the restaurant and they'll be happy to assist with your dining arrangements. The restaurant manager checked on us more than once and I asked about the number of sister restaurants, which he confirmed is now up to eight establishments, and then he added amusedly, "But there is only ONE." 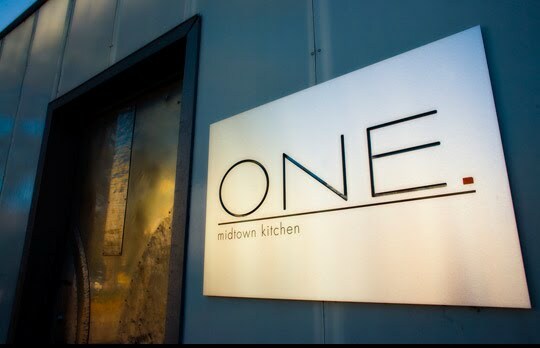 ONE midtown kitchen indeed remains a favorite and I'll definitely be back. With their ever-changing menu and talented chefs, the next dinner promises to be a pleasant surprise.